Enjoy a relaxing stay during your business trip or weekend getaway at our modern convention center hotel in Philadelphia, PA. 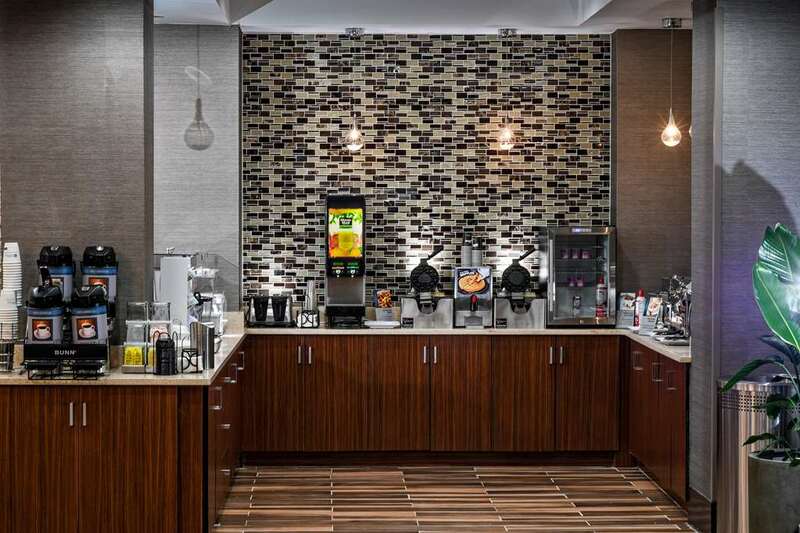 The Best Western Plus Philadelphia Convention Center Hotel is a newly-built property just minutes from major attractions. Located steps from City Hall, this downtown hotel is the place to stay when visiting area colleges and universities, historic attractions, and the convention center. Our modern hotel is the perfect place to relax after a busy day of work or play. Our rooms are furnished with a refrigerator for your convenience. Both valet ($37) and self-parking ($22) are offered by a third party vendor and are available offsite (two blocks away) for an additional fee. Look forward to a complimentary breakfast buffet featuring hot and cold items each and every morning, the perfect way to get your day off to a great start! Settle in for your favorite cocktail and socialize with friends and guests at The Vine Bar, open seven days a week from 5 p.m. to 11 p.m. All guests also have access to our 24-hour exercise facility equipped with free weights and universal weight machines. We also have yoga exercise equipment available so you can keep up with your healthy lifestyle. Sports enthusiasts are only a short subway ride from Citizens Bank Park and the Wells Fargo Center. You can make the short drive or hop on the bus to visit Independence National Historical Park, the Museum of the American Revolution or the National Constitution Center during your visit. Youll find plenty of fine dining and shopping around the hotel, as well as several boutique shops, galleries, and sidewalk cafes. Whether youre in town for business events at the convention center or just enjoying a leisurely vacation, we put you within easy reach of it all. Book now through bestwestern. com for the lowest rates and our Low Rate Guarantee. From: New York. Take Church Street to I-78 W in Jersey City. Take I-95 S and NJ Turnpike S to NJ-73 N in Mount Laurel. Take Exit 4 from NJ Turnpike S. follow NJ-73 N, Kaighns Avenue and US-30 W to I-676 W. The Best Western Plus Philadelphia Convention Center Hotel is just ahead. From: New Jersey. Get on I-295 S in Mansfield from Success Road, E Colliers Mill Road, Monmouth Road, Mt. Pleasant Road and Columbus Road. Continue on I-295 S to Philadelphia. The Best Western Plus Philadelphia Convention Center Hotel is just ahead. Convention Center,2 block(s) from Convention Center, annual city wide conventions held through out the year. Independence Hall,5 block(s) from Independence Hall, located less than 10 minutes from hotel. The Liberty Bell, Betsy Ross House, Liberty Center, and The Constitution Center. Reading Terminal,2 mile(s) from Reading Terminal, where you can feast on a variety of cuisines. Shop for Philadelphia and Pennsylvania gifts and listen to home town live musicians.